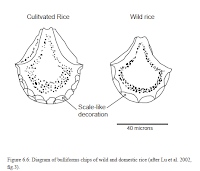 In preparing for a recent Bangkok workshop on the archaeology of rice, I have collected some thoughts of the proposed methodology for tracking rice domestication using rice bulliform phytoliths. Fan shaped bulliform phytoliths form along the veins of rice leaves. Rice (genus Oryza) has a distinctive shape although some fanlike bulliforms do occur in other grasses, but with different shapes. These are also sometimes referred to “motor cells” as these cells function, when alive, to fold and unfold the leaf and thus to control sunlight exposure, which in turn relates to amounts of photosynthesis and water evaporation from the leave. Once they are silicified and have become phytoliths they stop functioning so this tend to mean that the phytoliths come from older rather than younger leaves. These are relatively large for single celled phytoliths (28-40 µm) and therefore fairly easy to recover and to spot in phytolith slides. 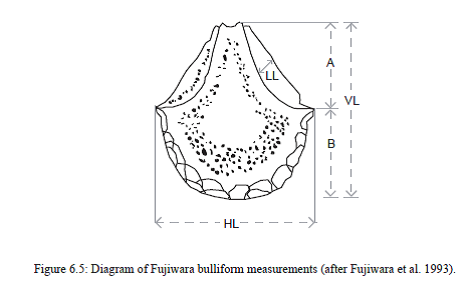 Bulliforms have suggested to be useful for tracking domestication, separating subspecies japonica and indica, and for studying crop processing. Identification approaches relies on measurements and/or counting variation in the number of chips along the scalloped edge of the fan. In terms of crop-processing they are an indicators of leaf presence (i.e. straw), i.e from harvested rice and/or threshing by-production as opposed to husk phytoliths that represent dehuksing waste. 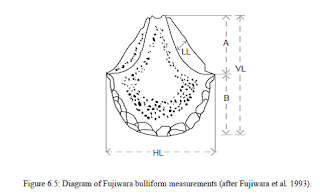 A study of bulliforms from Lower Yangtze archaeological sites suggest that they became large and more pronounced in their japonica morphological metrics over time, 5000 and 2000 BC, over the period when domestication was completed and grain size increased (Zheng et al 2003a). 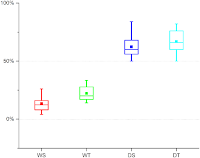 Measurements on controlled experimental crosses indicate the bulliform shape is influenced by numerous genes, with 16 genes (QTLs) suggested, but these QTLs only explain somewhere between 37% and 54% of the variation, suggesting the environment (growing conditions) play a major role (Zheng et al 2003b). No QTLs were correlated with the b/a ratio suggesting this may be largely environmental. Bottom line on metrics: May be useful for separating indica from japonica when it can be assumed that rice was fully domesticated; and trends may be found alongside domestication. Further work is needed, especially on aus and more variation found in South Asia and more tropical varieties in Southeast Asia. Bulliform scalloped margins: scale counts and domestication. Another approach to documenting bulliforms is to count the “scale-like” facets along the rounded edge of the “fan”. The fans in domesticated rices tend to have more facets. Initially Lu et al (2002) proposed that phytoliths with 9 or more facets are likely domesticated, while less than 9 are wild. 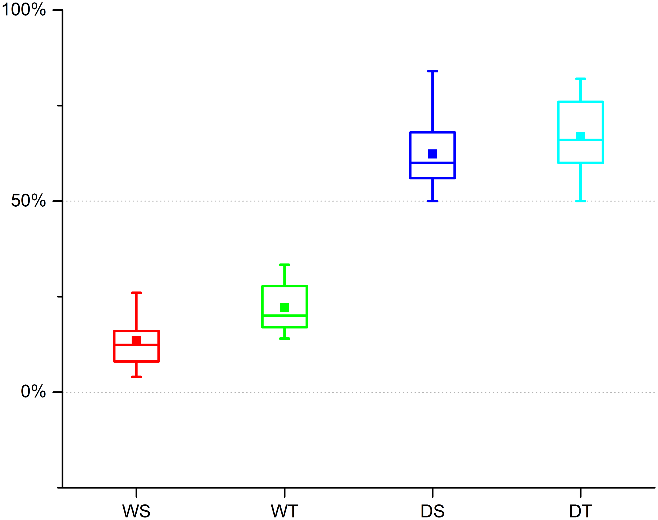 This has been backed up by field comparisons of wild and cultivated rices in South China (Huan et al 2015) These studies indicate that example with less than 9 facets occur in cultivated rice and more than 8 occur in wild rice but the frequency differences are substantial (see below). This means in in time series data assemblages can be used to track changes over time (below). This is nicely demonstrated in a time series through the Early and Middle Holocene for the Lower Yangtze by Ma et al (2016). It should be noted also that current approach of Ma et al (2016) exclude from counts any assymetric phytoliths. Time series of rice bulliform facet counts (% of ≥9) from Lower Yangtze sites (Ma et al 2016). These data show a direction of travel over time that is similar to non-shattering, grain size increase and other indicators. However, much variation is hidden by the fact that difference between 8 facets (very common in wild rices) and 9 facets (probably the most common value in domesticated rices). In addition, an explanatory mechanism is not yet firmly established, unlike established domestication traits such as non-shattering and seed size. While ~16 genes may affect bulliform shape, environmental factors are also essential, and domestication is ultimately about genetic changes that differentiate domesticates from their wild ancestors. Therefore it is essential to understand how much of this shift phenotypic response to environmental conditions as opposed to evolution. Huan et al (2015) suggest that the increase faceting in domesticated rice is due to increased use of leaf folding to control evaporation from leaves. They hypothesis that the erect growth habit of rice and drier growing conditions than wild rice would lead to increased faceting. If this is merely a phenotypic response then it becomes a less useful domestication indicator. 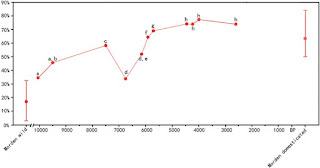 But this can also be questioned, as ecological indices (see below) suggest that early rice in China was grown under wet, wild-like conditions (at least at Tianluoshan) and that erect growth habit and drier conditions occurred only from the later Majiabang period, and then returned to very wet conditions (Weisskopf et al 2015). So further work is needed to understand genetic and phylogenetic signal in bulliform facet variation as opposed to difference to due with habitat. The bottom line: on the whole this looks like a promising and worthwhile complementary dataset, but it remains no substitute for morphological domestication data from macro-remains, as other environmental factors seem to be at play. In addition it is worth noting some studies that question the reliability of this approach. Applications in India that raise questions over the universal applicability of this approach. Harvey (2006 PhD, UCL) counted this chips on bulliforms from Chalcolithic sites in Orissa (Golbai Sassan and Gopalpur, dating 1500-1000 BC), both of which have domesticated rice (based on spikelet base data), and wet field ecology (further work by Kingwell-Banham 2015, PhD UCL). 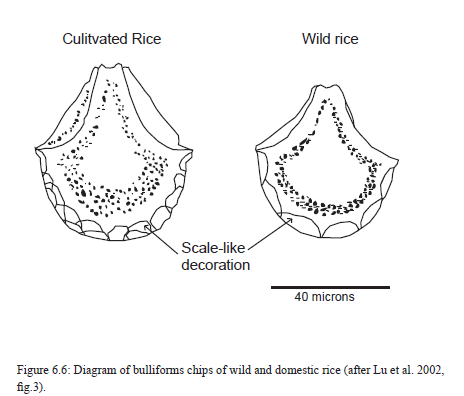 In this material the average number of chips is 8.6 and thus “wild “ according chip count standards used by Chinese researchers.This is out of agreement with the non-shattering spikelet base data, weed flora and the large village context all of which indicate fully domesticated, wet-rice based agricultural economies. Saxena et al (2006) applied this to phytoliths from the lake sedimentary sequence at Lahuradewa, next to a Neolithic site in the Ganges plain of the same name. They reported both wild and domesticated bulliforms through the core is roughly equal proportions between 8600 and 3500 BP after which wild forms declined. While Lahuradewa is often discussed an an early site of rice cultivation in India, critical review suggest this was primarily wild rice gathering prior to ca. 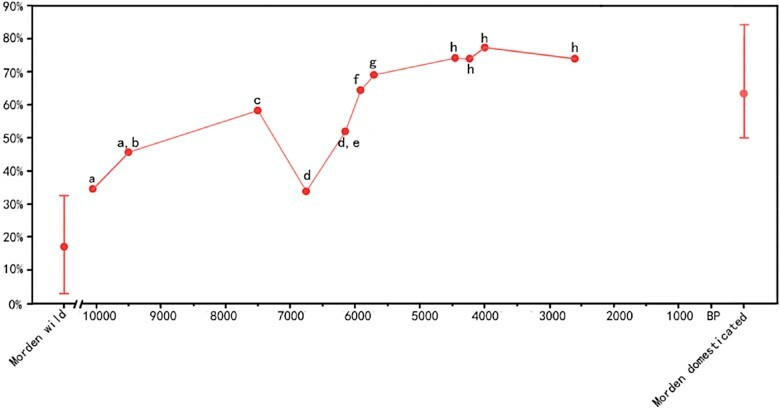 2000 BC or so after domesticated rice became available through hybridization with japonica (the proto-indica hypothesis) (Fuller and Qin 2009; Choi et al. 2017; Murphy and Fuller 2017). Thus the phytolith data here appear out of agreement with macro-remains and rice genetics. The Loagan Bonut pollen core on Borneo near Niah Cave produced substantial quantities of rice bulliforms with high facet counts (i.e. “domesticated”) around 8000-7500 BP, but not later (Hunt and Premathilake2012). Is this also to be interpreted as a lost domestication of rice? Or could this be a particular situation in terms of environmental conditions that encouraged wild rice and more leaf folding and bulliform faceting? Most of the above cases have all been presented as evidence of early farming, which would represent “stealth domestication” without other clear indicators for cultivation over the millennia leading to these nor continuing into subsequent period. In all cases phenotypic plasticity in response to environmental change needs to be considered, and realistically dismissed before domestication can be adequately diagnosed. I can see the development of the rice in this black and white diagram. Although this process is very much difficult but it's somehow interesting. You can also deal with good bachelor thesis structure from this essay which is a good thing. Students often confused in writing thesis. That's why I'm going to introduce the best site where you can get best ideas and topics on theis writing. For more detail have a look https://www.writemythesis.net/best-topics-for-thesis-on-immigration/. This is very difficult to understand and give us a tough time. We can also write thesis if we hire a tutor or an expert that can help us a lot. So for me writing is not a big challenge anymore. Thanks for this post. This is an amazing post for students who can write important things now. Writing biographies are best way to develop your positive skills. I really impress by this post. The place to study World Archaeology and Archaeological Sciences.